SAN DIEGO, CA--(Marketwired - May 01, 2017) - Hubert Greenway, M.D., chairman of Mohs and dermatologic surgery at Scripps Clinic, received the Frederic E. Mohs Award from the American College of Mohs Surgery at the college's annual meeting in San Francisco on April 28. The award honors Dr. Greenway's lifetime achievements in promoting Mohs surgery for skin cancer, through teaching, clinical practice, scientific contributions, innovation, mentorship and service. The late Dr. Mohs developed the Mohs surgical technique, which involves surgically removing skin cancer layer by layer and examining the tissue microscopically until healthy, cancer-free tissue around the tumor is reached. The technique's precision, tissue-preserving capabilities and success rates of up to 99 percent make it a preferred treatment for various skin cancers. "Dr. Greenway has made enormous contributions to the field of Mohs surgery and to the many skin cancer patients he has successfully treated at Scripps," said Scripps Health President and CEO Chris Van Gorder. "We are delighted to see him receive this richly deserved recognition." Since joining Scripps Clinic in 1984, Dr. Greenway has performed more than 31,000 Mohs surgery cases and has trained 46 fellows, who today practice throughout the world in academic and clinical settings. 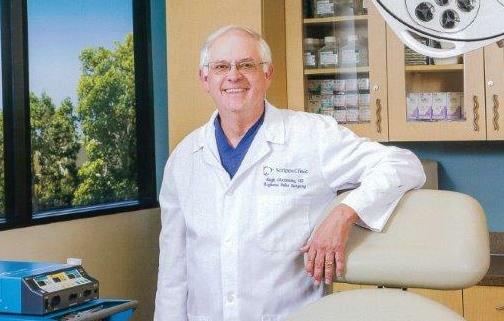 Dr. Greenway was fellowship-trained in Mohs skin cancer surgery by Dr. Mohs at the University of Wisconsin in Madison. He earned his medical degree from the Medical College of Georgia in Augusta and his bachelor's degree from the University of Georgia in Athens. He is board-certified by the American Board of Dermatology, American Board of Mohs Surgery and American Board of Family Practice. A resident of Rancho Santa Fe, Calif., Dr. Greenway is a past chief executive officer of Scripps Clinic and a former president of the American College of Mohs Surgery. His medical service also includes assignments with the United States Navy, Air Force and Marines. Established in 1967, the American College of Mohs Surgery promotes and advances the highest standards of patient care with respect to Mohs surgery and cutaneous oncology through fellowship training, research, education and public advocacy. Hubert Greenway, M.D., of Scripps Clinic, has received the 2017 Frederic E. Mohs Award from the American College of Mohs Surgery.